'Solkeo pe engelop' masks were worn by fierce warriors who had taken many lives in battle. They were created from the hardened outer skin of the 'pe engelop' (bottle gourd), or calabash, and adorned with seed burrs and human hair. 'Solkeo' refers to a malevolent mythical figure that cannibalised its victims. Worn on rare occasions by one or two men during the annual mol dance, these masks symbolised evil power as well as courage and strength. Long lengths of tree moss also concealed the bodies of the masked men and their legs were covered in white clay. The Mendi people thought their Lake Kutuban neighbours were headhunters and referred to them as 'solkeo'. These masks resemble face designs worn during Lake Kutuban dance ceremonies. 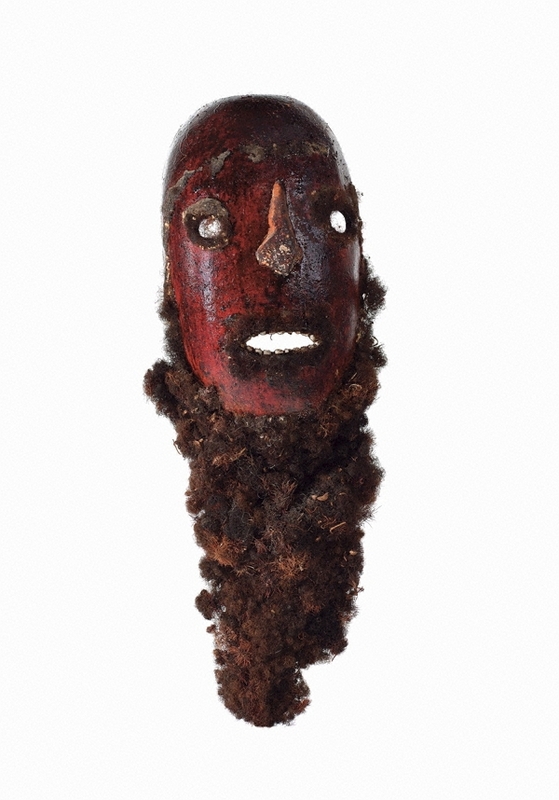 Mendi men travelled to Lake Kutubu to trade for 'tigaso' tree oil and may have adopted these decorations into their own ceremonies, symbolising the fierce warriors who had killed Mendi in battle.